The Connecticut Department of Energy & Environmental Protection (DEEP) has been actively involved in the operation of a Nitrogen Exchange Credit program since 2002. It is a rather sophisticated initiative ordered by the US Environmental Protection Agency (EPA) to mitigate pollution in the Long Island Sound. NY and CT are participants in the program. 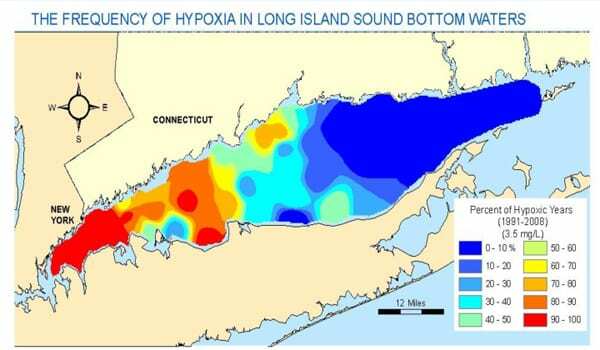 Large areas of the Long Island Sound at the pinch point of Long Island, Connecticut and New York City have a problem of oxygen deficiency in the late summer. Bottom waters are low or absent of oxygen rendering them unsuitable for healthy fish and other living resources. Monitoring has been on-going for about 20 years with an active program to reduce the amount of nitrogen coming from human activity. While ground water runoff is a problem it is impossible to manage. It is possible to manage and reduce nitrogen loads coming from Publicly Owned Treatment Works (POTWs). The CT Nitrogen Credit Exchange Report of 2007 states the issue succinctly. Nitrogen simulated the growth of microscopic algae that are either consumed, passing through larger zooplankton and fish, or die, ultimately sinking to the bottom of Long Island Sound as animal waste and dead algae, where they undergo microbial decay. During decay, oxygen is consumed. Because the Long Island Sound is stratified during the summer, bottom water oxygen replenishment is limited. The oxygen consumption from microbial respiration far exceeds oxygen replenishment from photosynthesis and wave action resulting in the severe hypoxia (oxygen deficient) condition. The action taken is to assign a limit to the pollution from each of the 79 POTWs in Connecticut. If that limit is exceeded credits must be purchased. If under the limit, a POTW receives funds. For Fiscal Years ending 2009 thru 2013 Danbury paid in about $1.5 million per year. 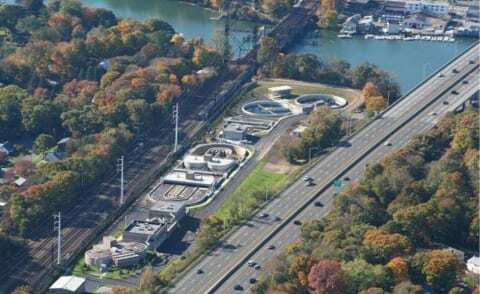 Since Brookfield contributes about 5% of the total wastewater processed by Danbury, the Brookfield share was about $60,000 per year or about $5 per household on the sewer system. This problem is now mitigated with nitrogen removal equipment at the Danbury plant to which Brookfield contributed. 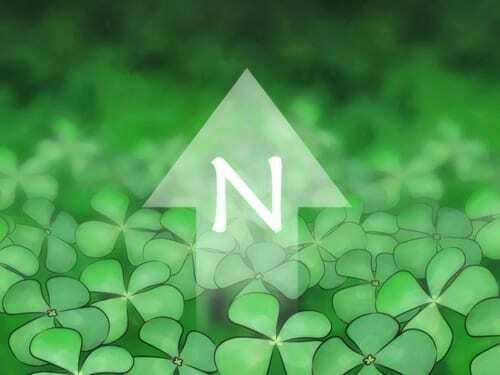 The nitrogen penalty is now low beginning 2014. For more on this program see Long Island Sound at www.ct.gov and have a look around.